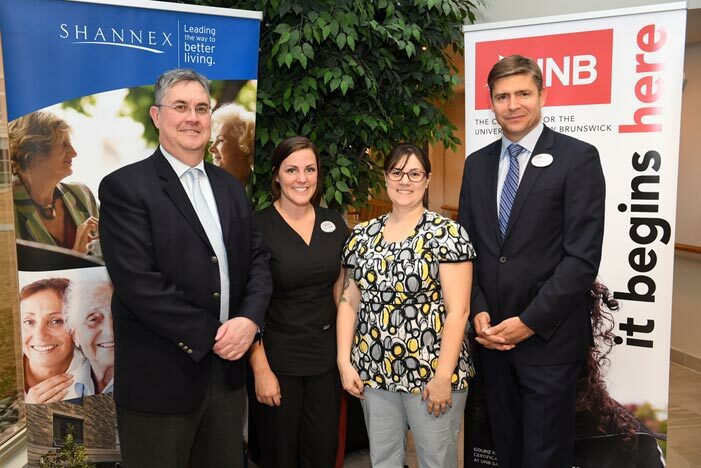 Thanks to the support of Shannex, University of New Brunswick nursing students showing promise in the area of gerontological nursing will be eligible for three Shannex New Brunswick Scholarships beginning in September. The Shannex New Brunswick Scholarships were announced today at a news conference at Parkland Saint John hosted by Jason Shannon, president and chief operating officer of Shannex, Eddy Campbell, president of the University of New Brunswick, and David Ganong, co-chair of UNB’s It Begins Here campaign. The scholarships, each valued at $3,750 a year, will be awarded to nursing students at each of UNB’s three New Brunswick sites – Fredericton, Saint John and Moncton. Selection will be based on academic achievement and recipients will demonstrate excellence in the practice of gerontological nursing. Cathy O’Brien-Larivee, chair of the department of nursing and health sciences at UNB’s Saint John campus, says that these scholarships will provide significant assistance to hard-working students who are actively pursuing an interest in the care of the elderly in our region. These new scholarships will help reduce the cost of tuition for nursing students, relieving financial uncertainty and allowing them to focus on their studies. They will also provide affirmation that each recipient’s hard work and dedication to the profession of nursing is valued. Student support is a significant part of UNB’s $110-million fundraising campaign, It Begins Here. Fully one-half of the campaign goal – $55 million – is dedicated to student financial support, funding scholarships, bursaries and programs to expand accessibility. Shannex Incorporated has been in business since 1988 and is a leader in seniors’ accommodation, service and care – providing home care, retirement living, assisted living, memory care and nursing-home care in Nova Scotia, New Brunswick and Ontario.